Reggie Wayne is known for always making an impression when he arrives for training camp. Saturday, it was no different for the 13 year NFL veteran. Below are Instagram videos of Reggie’s arrival. Follow us on Instagram for more behind-the-scenes footage of Colts Camp. For the full video of Reggie’s arrival, click here. Anthony Castonzo isn’t high maintenance when it comes to bringing items to training camp. “There’s really nothing else more other than that,” Castonzo said upon his arrival to Anderson on Saturday morning. Castonzo is in his third NFL season and as he enters another training camp the Colts left tackle offered some advice to the 2013 rookie class. This time last season Coby Fleener was fresh off a busy rookie offseason, where the tight end finished up his Stanford degree while learning an NFL offense. Fleener’s advice for the rookies? Then there’s 11-year veteran Cory Redding who addressed the media with his name tag lanyard around his neck, like it was his first training camp. Redding’s message is direct, one you would expect from a player with the last few years of an NFL career upon him. It’s move in day at Colts training camp. To get you started here are a couple of pieces that look back on the Colts history with the team celebrating their 30th season in Indianapolis. Also, an article on the emergence of T.Y. Hilton and the unique approach the Colts took to the 2013 offseason. Each morning Colts.com will take a look at the top headlines surrounding the Indianapolis Colts from around the globe. What is the local and national media saying about the Colts? Take a look below at the top pieces from Saturday, July 27th. With the Colts about to embark on their 30th season in Indianapolis, the IBJ takes a wonderful look back on the move from Baltimore. Schoettle interviewed the three Colts employees still left from that move—Pete Ward, Jon Scott and John Starliper to get some background on the late night mission. In the hours before the move, Starliper was sent to the airport to pick up Colts General Counsel Michael Chernoff and Mayflower CEO John B. Smith. “I felt like I was on ‘Miami Vice,’ with media trucks and everything following us around,” said Starliper, who was a 25-year-old assistant film director. Chappell takes a look back at the Colts offseason and how things have changed from an approach standpoint. Ryan Grigson and the Colts were big spenders this offseason and moving forward the 2013 offseason could have a significant impact on the team’s success. The Colts were criticized for some of their moves, most notably giving outside linebacker Erik Walden $16 million over four years. The heftiest outlay was a five-year, $35 million deal for right tackle Gosder Cherilus. Grigson insisted the free agents were good “fits” for the offensive and defensive schemes. Pagano agreed. Chappell wrote a blog to explain the difficulty in choosing his all-Indy team that celebrates the Colts 30th season in Indianapolis. The Indianapolis Star writer has followed the team nearly every step of the way since the move to the Circle City. From that first regular-season game in the Hoosier Dome – a 23-14 loss to the Pat Ryan-led New York Jets Sept. 2, 1984 . . . yes, Pat Ryan – to the 24-9 AFC wild-card playoff loss to the Ravens in Baltimore Jan. 6. From Clarence Verdin and Tony Siragusa to Jeff George and Eric Dickerson, from Peyton Manning and Edgerrin James to Andrew Luck and T.Y. Hilton. So many lows and highs. So many personalities. So many memories. The offseason praise for T.Y. Hilton continue to pour in. In this article, Rosenthal explains why Hilton finds himself at No. 9 on the 40-player list of guys “making the leap” in 2013. The Colts signed Darrius Heyward-Bey, who will compete with Hilton for snaps. But this is more about Hilton’s own personal development. Hilton played fewer snaps last year than Donnie Avery, who is very similar to Heyward-Bey as a straight-line speed guy. Hilton has a higher ceiling and a more natural feel of the receiver position. He just has to show improved awareness and consistency as a second-year pro. If Hilton played in Jacksonville, he wouldn’t be on this list. But Luck’s presence gives guys like Hilton and tight end Dwayne Allen a real shot to be annual Pro Bowl selections. (Chris Wesseling had a great write-up on Allen here.) Luck is our favorite young quarterback in the league and could be a top-five quarterback as early as this season. Guys like Hilton will look even better than they really are, and that should mean a 1,000-yard season for Hilton in Year 2. T.Y. Hilton made a promise to his new college football coach Mario Cristobal. The first time the electric Hilton would touch the ball on the collegiate level he would score a touchdown. So Cristobal sent Hilton out for punt return duties during the second quarter of Florida International’s 2008 season opener against Kansas. Hilton, true to his word, fielded the punt and went 74 yards the other way for a touchdown on his first collegiate touch. With the dynamic abilities of Hilton, FIU made their first career bowl appearances in 2010 and 2011. Now Hilton is helping build a monster with the Indianapolis Colts after turning in one of the league’s best rookie receiver performances in 2012. Colts fans have witnessed a few of the “T.Y., Goodbye” touchdown celebrations that FIU fans frequently witnessed. Despite having a prolific career at FIU, Hilton watched as 13 receivers were chosen before the No. 92 pick in the third round of the 2012 NFL Draft. “I saw how everybody passed on me and I was waiting for somebody to take that chance,” Hilton said. Hilton has high expectations when it comes to his NFL future and after his rookie campaign who can blame him. “This is a person and a player who wants to be great and isn’t afraid to say that he wants to be great,” Trotter said of Hilton. Below is the Sports Illustrated video with interviews from Hilton, Pelegrin and Trotter. 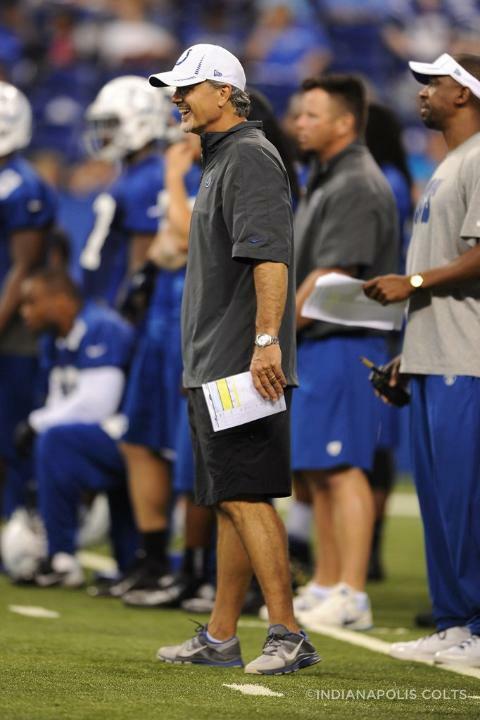 When Chuck Pagano stands before his 90 players at the first team meeting of the 2013 training camp, he will pop in a highlight video. The highlight video will include a clip of a scoreboard that shows just how close the Colts were last season. Against the eventual Super Bowl XLVII Champions, there were the Colts down 17-9 early in the fourth quarter facing a first-and-five from the Ravens 18-yard line. A penalty and two incompletions were sandwiched around a one-yard rush, thwarting a potential game tying drive with the Colts momentum ending in a missed 40-yard field goal. Yes, the Colts proved numerous doubters wrong with their 2012 performance but there was still something missing. While celebrating under the confetti come February 2, 2014 remains the ultimate goal, Pagano will tell his team that the initial goal revolves around four teams. Last year, the Colts fell a game short of winning the AFC South and capturing that division will punch their ticket into the month of January. “First thing, we’ve got to retake the (AFC) South. The easiest way to get into the dance, get into the playoffs, is to win your division,” Pagano said. With players reporting to training camp tomorrow, the Colts made an intriguing roster move on Thursday afternoon. Also, check out what some members of the national media have pegged the Colts this season. The roster moves continue to pour in for the Colts as the team signed outside linebacker Daniel Adongo and waived tight end Weslye Saunders. 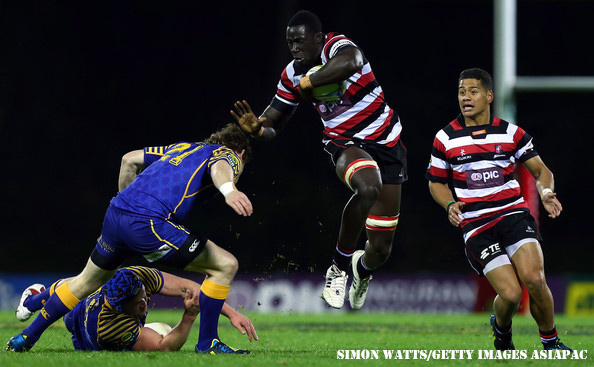 Adongo, 23, is a standout rugby play from Kenya who stands 6-5 and weighs 257 pounds. Adongo, a 23-year old Kenyan national, is a 2006 graduate of Strathmore High School in Nairobi who attended the University of South Africa the following year. His rugby resume includes playing in the 2012 Varsity Cup for the University of Pretoria Tuks, the Vodacom Blue Bulls and the New Zealand ITM Cup team Counties Manukau. Colts links: Do the experts think Indy will make the playoffs? The pundits have weighed in on where the Colts will end up in 2013. ESPN.com has the Colts ranked 10th and grabbing the sixth and final AFC playoff spot. NFL.com has Indianapolis at No. 12 and the sixth-best team in the AFC. “Picking up Ahmad Bradshaw was enough to give the Indianapolis Colts a slight bump (overall) over the Chicago Bears,” NFL.com said. WalterFootball.com completely breaks from the pack, picking Indianapolis 19th overall, putting Miami in the playoffs and ranking Pittsburgh ahead of the Colts. The blurb on the Colts questions the signing of OLB Erik Walden. Live Chat Today at 11:00 A.M. This Friday, I will host a one-hour chat called “Horseshoe Roundup” beginning at 11 a.m. Starting next week, the chat will be moved to once every week until the season ends. During training camp, the chat is tentatively scheduled for 8 p.m. on Thursdays with the first coming on August 2nd. For this week, the Colts are now less than 24 hours away from reporting to training camp. What are your burning questions heading into training camp where the Colts roster will dwindle down from 90 to the difficult number of 53? Feel free to join the chat via this link around 11:00 a.m. on Friday (scroll to the bottom of the page) and we will talk for an hour about whatever is on your mind. ADONGO A MARCUS POLLARD IN WAITING????? Ryan Grigson likely never sleeps. In his first year with the Colts, Grigson pulled off more than 250 transactions. He plucked talent from the AFL, IFL, UFL and CFL. The IFL featured eight players per side who clashed on a 50-yard field. Tight end Dominique Jones was Grigson’s find from that league. On the near eve of training camp, Grigson has mined new fields, signing rookie linebacker Daniel Adongo – a now-former rugby player. Adongo, 6-5, 257 pounds, is a 23-year-old Kenyan national who most recently played for the Southern Kings of Super 15 Rugby, the highest level of pro rugby in the world. Previously, he played in the 2012 Varsity Cup for the University of Pretoria Tuks and is currently working towards earning his degree from the school. In 2011, Adongo was signed by the Vodacom Blue Bulls, but was released from his contact after six months to join the New Zealand ITM Cup team Counties Manukau. Adongo graduated from Strathmore High School (Nairobi, Kenya) in 2006 and attended the University of South Africa the following year. He also attended the Sharks Academy, a rugby academy accredited by South African Rugby, and made his senior debut in the 2010 Vodacom Cup. In addition, Adongo played for the Kenya Harlequins junior team before going on to play for Kenya’s U-18 and U-19 national teams. Given Grigson’s track record, Adongo may have a shot. If so, Colts fans have related experience, too. In 1995, Marcus Pollard hit town. He never had played football – only basketball. Even when he was inside the training complex, Pollard did not know what his future held. Pollard had a great Colts career at tight end, finishing with 263 receptions and 35 touchdowns for the Colts and playing 13 years in the league. 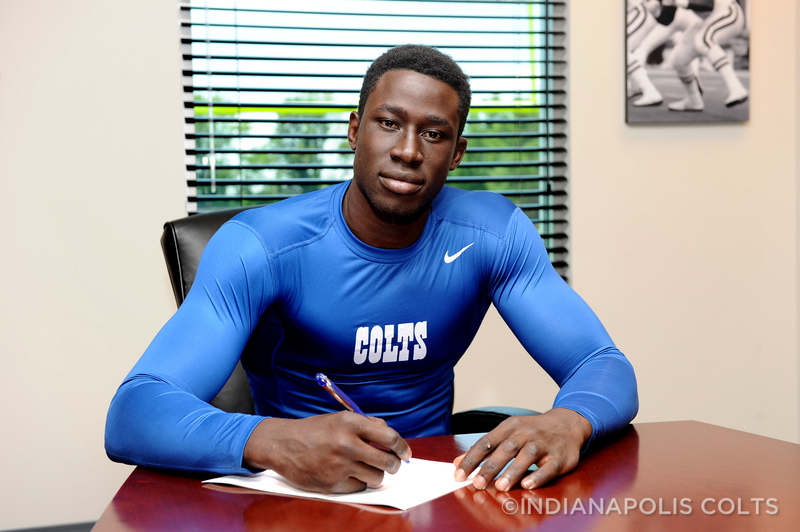 The Indianapolis Colts today signed outside linebacker Daniel Adongo and waived tight end Weslye Saunders. 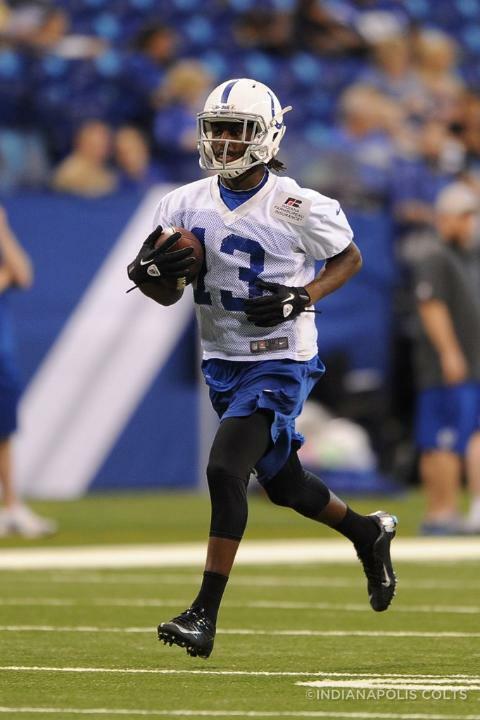 Saunders was originally signed by the Colts on October 16, 2012. He played in 11 games (four starts) last season and recorded two receptions for 15 yards. Thursday’s headlines begins with a piece from Associated Press where Jim Irsay talks about the Colts Super Bowl expectations moving forward and how that has impacted past decisions. Also, Chuck Pagano addresses the Colts disappointing end to the offseason. Lastly, the Colts signed first round draft pick Bjoern Werner on Wednesday. Take a look below at the top pieces from Thursday, July 25th. Marot had an exclusive interview with Colts owner Jim Irsay. In Marot’s article, Irsay goes in-depth on what he regrets about the way Peyton Manning left town and the more balanced attack that the Colts are striving for moving forward. It’s been a tough end to the 2013 offseason for Chuck Pagano and the Colts. A few off-the-field issues has marred a busy offseason with numerous free agent additions. As expected, the Colts signed Bjoern Werner on Wednesday and that means all seven 2013 NFL Draft picks will be in Anderson for training camp. Werner has exceeded expectations according to Pagano in making the adjustment to a stand-up role at outside linebacker. “The transition from playing down all those years with his hand in the dirt and playing on the left side (at Florida State), he came in here and he’s playing in a two-point (stance),’’ Pagano said. “We’re asking a lot of him from a mental standpoint and he just picks it up.